The Special Collections & Archives are excited to announce that the Thomas H. Ward Papers are open and available for research! Learning about the past never gets old here in the archives. The Thomas H. Ward Papers offer a unique perspective on aspects of Baltimore’s 20th century history that many researchers will find interesting. This recently donated and newly processed collection contains a large amount of correspondence, newspaper clippings, legal documents, photographs, and other materials that provide insight into Ward’s involvement in city politics and historic preservation as a Baltimore City Councilman, a Baltimore Circuit Court Judge, and lifelong Baltimore resident. Thomas H. Ward (b. 1927 – d. 2016) was born and raised in West Baltimore and remained active in the city’s politics and community throughout his life. Ward advocated for historic preservation throughout the city, and was often critical of city urban renewal plans. Ward’s papers in the Special Collections & Archives contain documents that show Ward’s perspective on several controversial issues in Baltimore’s recent history. A significant portion of the collection documents Ward’s work and his criticism of the 1960s-1970s urban renewal plans for the Mount Royal-Fremont area, Mt. Vernon neighborhood, and other neighborhoods. 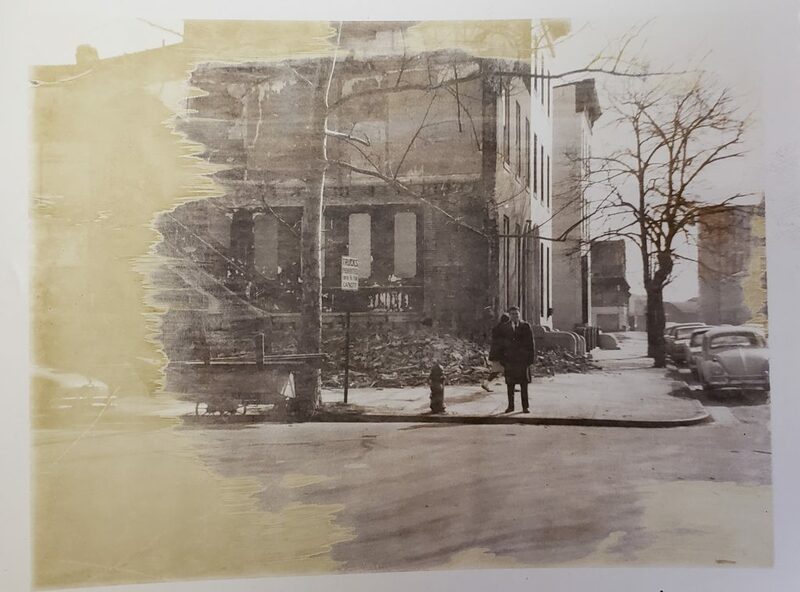 One event that may have sparked Ward’s initial interest in the urban renewal projects in Baltimore was the city’s plans for his original law office in 1960. Ward had a keen interest in historic preservation and his first law office was located in a large mansion on Linden Avenue that had once been home to Maryland Governor Edwin Warfield. However, despite the building’s historical and architectural relevance, it was designated for destruction as part of a plan for urban renewal in the area. Governor Warfield held office in the early 1900s and was related to the Duchess of Windsor, also known as Wallis Simpson. The Duchess was a Baltimore native, and Ward wrote to her in 1960 in hopes of gaining her interest and support in preserving the building. 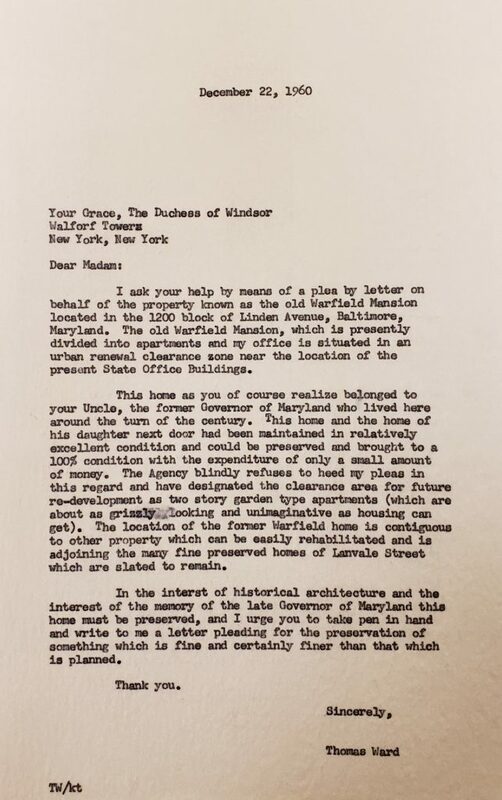 Though it is unclear if the Duchess wrote back to Ward, this piece of correspondence serves as an example of Ward’s persistence and commitment to historic preservation in Baltimore City. Unfortunately, despite Ward’s attempts, the city eventually condemned the large mansion as a part of urban renewal and development. As a City Councilman, Ward criticized the Urban Renewal projects throughout the city including in Mt. Vernon, the Mount Royal-Fremont area, Eutaw Place, and others. A significant number of documents and photographs in this collection relate to the urban renewal projects of the Baltimore Urban Renewal and Housing Agency throughout the 1960s and early 1970s. 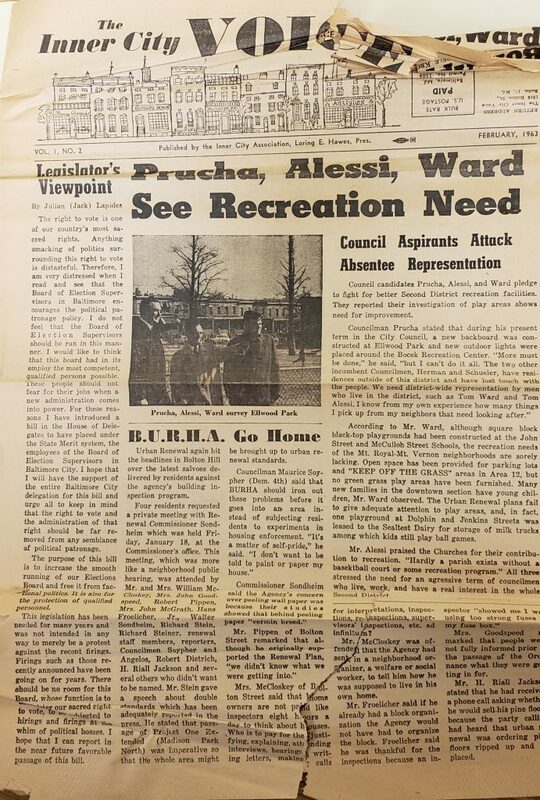 The Thomas H. Ward Papers also contain correspondence, newspaper clippings, narratives, and legal documentation that tell the history of Ward’s opposition against the proposed East-West Expressway and the West Side Connector (I-70) in the 1960s and 1970s. Ward was a City Councilman between 1963 and 1967, and he worked tirelessly to block the expressways proposal. 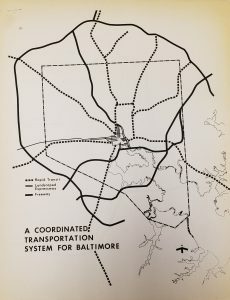 As many historians studying 20th century Baltimore know, the East-West Expressway in Baltimore was part of a plan in the city that proposed the construction of three major highways to be built through the city. The proposal initially included plans for I-95 to travel from the west through Federal Hill, across the harbor, through Little Italy, then east. It was also planed that I-70 would cut through Leakin Park, Gwynns Falls Park, and join with Martin Luther King Blvd. to continue south where it would intersect with I-95. The third highway in the proposal was I-83, which was planned to continue south and connect with I-95. The planned roads and their routes would have negatively affected the city by cutting through many historic neighborhoods including Federal Hill and Fells Point. As a City Councilman from 1963-1967, Ward opposed the Expressway. He was able to help block the Ordinance for the Expressway until it passed in 1967 in a 20-1 vote. Ward’s was the single vote opposing the Expressway in the City Council. But, just as with his old law office, Ward did not give up. In 1967 Ward and others founded the Society for the Preservation of Federal Hill and Fells Point. The neighborhoods were then listed on National Register of Historic Places. And when the Society filed suit against those responsible for the expressway plan, they finally prevented the road from being built through Fells Point and Federal Hill. The route for the road was moved. Ward then supported other Baltimore neighborhoods in their own fights to prevent large expressway highways from disrupting their homes and historic neighborhoods. He and others filed a lawsuit that finally blocked I-70 from passing through Leakin Park. Ward’s work and impact in Baltimore has been extensive. The city might look very different today if he had not been involved in efforts to prevent the expressways. Researchers interested in the ‘Road Wars’ in Baltimore, urban renewal, community groups and efforts that fought against the expressways, or other related issues in Baltimore during the 1960s and 1970s, will find the Thomas H. Ward Papers particularly interesting. The collection contains correspondence, documentation, newspaper clippings, photographs, reports, legal documents, and other materials showing Ward’s work as a City Councilman; his historic preservation efforts in Baltimore; his commitment to improved public transportation and other issues in the city; his election as a judge; and his many other activities as a citizen and city councilman in Baltimore throughout his life. If you would like to view and/or use the Thomas H. Ward Papers for yourself, please contact the Special Collections & Archives to set up an appointment! This entry was posted in archival research, archives, history, Special Collections and tagged 1960s, 1970s, Archival Processing, Baltimore, Baltimore History, found in the archive, Historic Preservation, Road Wars, Special Collections and Archives by Laura Bell. Bookmark the permalink.